I provide a broad range of technical support, based primarly at the Marine Station building, Coxside, Plymouth. My duties include; looking after the equipment store/ deploy / manage / maintain scientific equipment; taking bookings/ loans for fieldwork/ student projects, facilitating and supporting teaching + research both afloat and ashore. 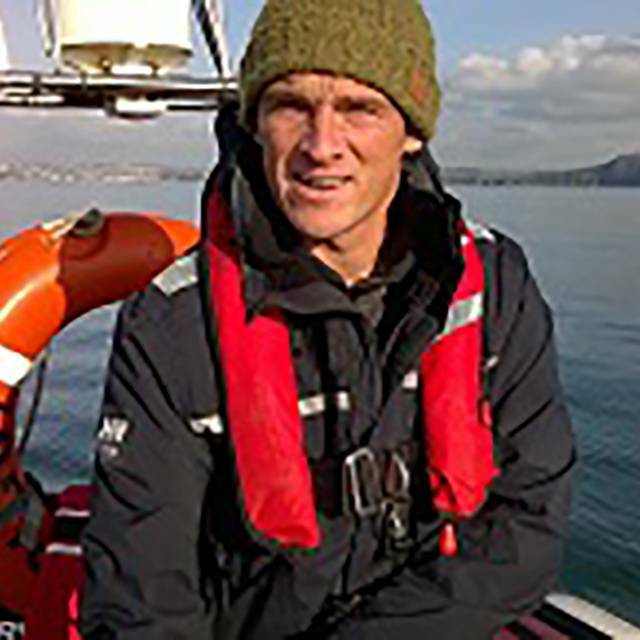 I am a commercially endorsed PB level2 skipper for the small vessel fleet that operate in and around Plymouth Sound / Tamar catchment area, My role involves skippering small fleet vessels as well as deck operations and technical support on the entire fleet during teaching and research. I provide technical and safety support for two foreign fieldtrips to South Africa and Great Abaco in the Bahamas. I've been working on funded Research projects (DRIBS and BLUECOAST) deploying equipment and skippering RV CODY operating bathymetric survey equipment at Start Bay and Perranporth. I have also gained qualifications relevant to lifting and loading heavy items using our overhead and quay crane. I contribute regularly to the upkeep and maintenance of the fleet throughout the year. I came to work at the University in 2002, after six years as an RNLI Beach Lifeguard/Supervisor in the South Hams area. I am a qualified SLSGB Beach Lifeguard and Inflatable Rescue Boat Coxwain and Crew. I also hold qualifications as a BSA Surfing Instructor, RYA Powerboat driver - level 2, RYA Safety boat driver. I studied Information Technology at Univerity and graduated with a 2:1 from the University of Exeter. From 2007 - 2012 I ran the Exercise + Physiology Lab ( located first in Davy Link block building and then subsequently W12 Brunel labs) for a cross Faculty facility used by students in the Faculty of Science and the Faculty of Biology. This facility was handed over to the School of Biology and is still in operation today. I maintained, calibrated equipment used to measure and monitor human performance in sport and provided technical support for teaching, research and student projects. During 31/05/08 to 01/06/08 I attended Surf-Lifesaving Great Britain's first NARS Beach Lifeguard Trainer Induction course, at Saunton Sands SLSC in order to become a fully qualified Beach Lifeguard trainer during 2008. During 2009 I successfully trained UOP students to become qualified NARS Beach Lifeguards. During summer 2010 I successfully trained another two BSc Surf-Science students to become qualified NARS Beach Lifeguards, securing my NARS Trainer award. These students gained employment as a seasonal Beach Lifeguards with the RNLI in the South Hams. March 2016 - I have a commercially endorsed PB level 2 skipper for small boats, which encompasses VHF, Sea Survival, PRR exam, Emergency First-Aid and boat handling skills. My current role is a Grade 4 Technician at the Marine Station. Scientific Equipment Storage and Deployment. Marine Station store to all vessels and fieldwork loans. Purchasing Equipment, Services and consumables via ordersMSE working closely with Robert Mann. Skippering small fleet vessels for teaching and project work from the Marine Station to Plymouth Sound and Tamar River. Providing Technical support afloat on small vessels as well as deck operations on some of the larger fleet. Working with Research projects (DRIBS and BLUECOAST) skippering CODY and working with instrumentation afloat and in the field. I also hold qualifications relevant to lifting and loading that relate to the moving/lifting of heavy items using our overhead crane (regular boat maintenance) and FASSI quay crane. Single beam bathymettry surveys for BLUECOAST research project, Start Bay and Perranporth. Skippering RV CODY and operating survey equipment / RTK GPS.